Why Use a Portable Dry Herb/Herbal Extract Vaporizer? 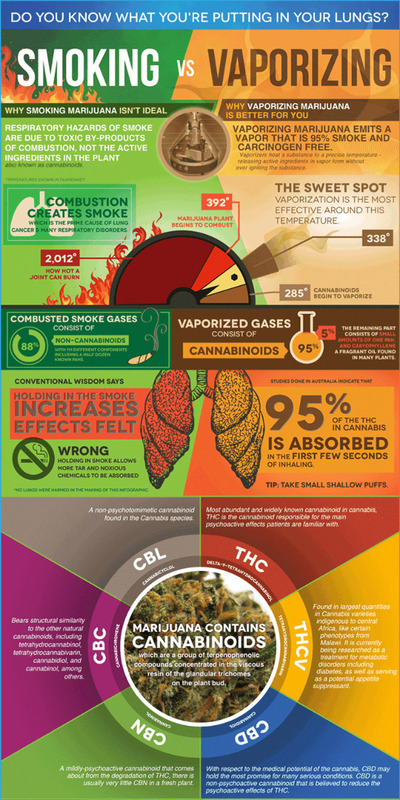 Vaporizing dry herbs/herbal extracts offers many benefits compared to smoking it. While smoking dry herb is done by simply lighting up the material and inhaling the smoke produced, the vaporization process will heat the material to a certain temperature where it will only emit the essential elements that we actually want to consume. Smoking is essentially burning it and therefore ingesting the carcinogens associated with combustion which is what you do NOT want to consume. By vaporizing dry herb/herbal extracts you are not burning anything but rather heating before combustion, it is comparable a convection oven. A vaporizer blows hot air over the dry herb/herbal extracts allowing the essential elements to be released in the form of vapor which can be inhaled allowing the plant matter to be used in more efficient way. Since the vaporization process does not produce any carcinogens which are associated with smoking, switching to a vaporizer seems like a healthier and much smoother delivery device for ingesting dry herbs/herbal extracts. Also vaporization produces less aroma making it a discreet option. Portable dry herb/herbal extract vaporizers come in various shapes and sizes, the main difference between vaporizers is the built in heating system that is powered by the battery. Some allow you to set your device to a specific temperature while others have preset temperature settings. Portable vaporizers are popular because you don't need to rely on any skill; the battery and the internal components of the vaporizer do it all for you. All you need to do is pack your vaporizer with your material and simply ignite and enjoy the essential elements produced, anywhere, anytime. Vaporizers are used by people who enjoy vaping tobacco, other natural herbs and extracts. Some enjoy the natural taste and others use this device for medicinal purposes for a therapeutic effect.